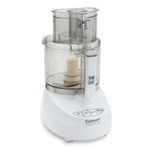 What size food processor to buy depends on your family size and how regularly you plan to use the appliance. Singles and couples may be satisfied with a miniature model that holds just a few cups of food. 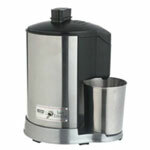 Larger families should look for large-capacity food processors, some of which can hold up to 14 cups of food. 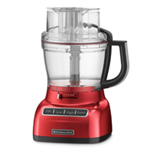 Also consider how much you’ll use the food processor as you look at models with various special features and wattage levels: Don’t pay extra for features or power you don’t need. 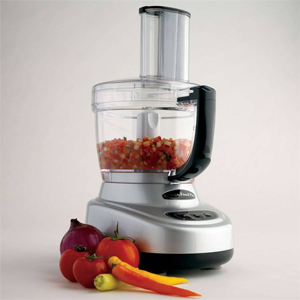 A food processor can save you lots of time and work in the kitchen. 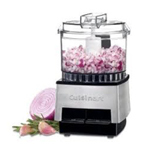 Today’s most versatile models offer chopping, grating, slicing, grinding, mincing, and pureeing features: essentially doing everything that you would otherwise have to do by hand. 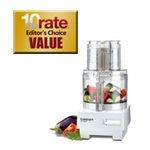 High-end models even have convenient accessories and features, like juicers and reversible slicing discs. 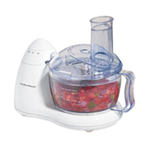 What’s extremely important, however, is that you carefully consider how you plan to use your food processor. The last thing you need is to spend all that money on an appliance that just sits on the counter taking up space and collecting dust. The happier you are with the food processor’s functions and capabilities, the more likely you are to use it on a regular basis. Here are some factors to consider as you shop for the perfect model. You don’t need the biggest bowl available if you have a small or average size family. 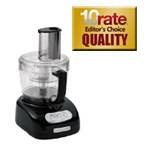 Medium-size food processors, which hold up to 7 cups of food, are usually adequate. Only spring for the largest size if you have a huge family, cook in large quantities, or regularly entertain company. This is a must-have feature. Stainless steel is the most durable and effective material when it comes to blades. They are strong enough to slice through even the toughest foods and won’t rust or wear down. Consider models that offer multiple blades for added versatility. 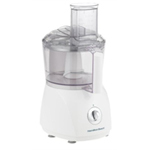 The higher the wattage, the more powerful the food processor. The most expensive models cost so much because they have enough watts to quickly and efficiently pulverize any type of food. If you plan to use your food processor heavily, don’t buy a model with less than 750 watts or it just won’t last as long as you’d like. The more functions a model performs, the more value you’ll get out of the appliance. 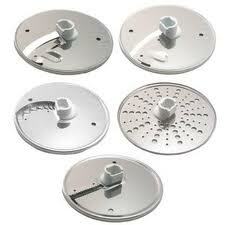 Food processors often come with various blades, discs, and other accessories that cover a range of functions. Some save you even more time by performing several functions at once. 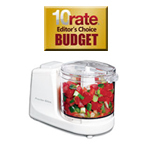 You should feel comfortable that you’re getting your full money’s worth with a food processor. See if the manufacturer has additional discs and blades for purchase. 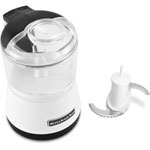 If you are a fan of fruit and vegetable juice, consider a food processor with handy juicer accessory. Keeping the food processor clean will be so much easier if you can simply throw the bowl, lid, and blades in the dishwasher. Check to see if a model has any small crevices that could trap food and require extra brushing or cleaning. Read the warranty details carefully to see if a manufacturer will replace or repair a faulty model. Sometimes a replacement part is all that’s necessary, but be sure that it won’t cost almost the price of a new machine.